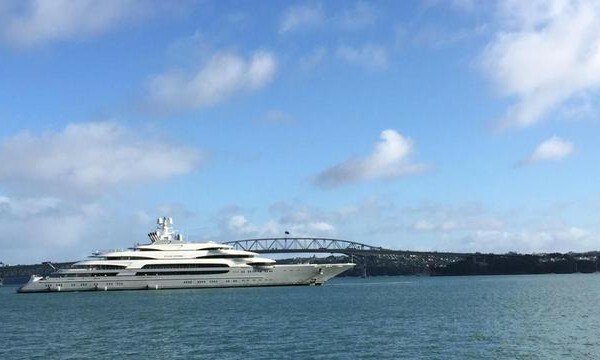 The 140 meter superyacht Ocean Victory — owned by billionaire steel magnate Viktor Rashnikov — has moored in Auckland, New Zealand after a tricky cruise from Fiji due to stormy conditions. Ocean Victory was reportedly forced to make an unscheduled stop at the Whangaparaoa Peninsula on Saturday (July 18) after New Zealand’s winter weather prevented her from getting to Auckland's Viaduct Harbour. After travelling from Suva, Ocean Victory had to moor just outside of Gulf Harbour marina, which can only accommodate yachts up to 55 meters. Ocean Victory was able to dock in Auckland Harbour on Monday morning after the worst of the weather had passed. The largest yacht to be built in Italy, Ocean Victory comes in at number nine on the list of the top 200 largest yachts in the world. The details of the superyacht were kept hidden during her build at Fincantieri and the Italian yard did not release any photos of Ocean Victory until after she was delivered in December 2014. The huge yacht was built to SOLAS regulations, which means that up to 36 guests can be accommodated. Ocean Victory has seven decks and her features include six pools, an underwater observation room, a 300 square meter spa area and a floodable tender garage. Her interior was designed by the late Alberto Pinto. The arrival of Ocean Victory is likely to be welcomed by the Destination New Zealand Superyacht Attraction Initiative Group, which has set a target to attract 74 superyachts to the country annually by 2018. Last season New Zealand celebrated a rise in the number of superyacht visits. In January 134 meter Serene, the twelfth largest yacht in the world, berthed in Auckland's Wynyard Wharf.